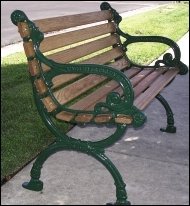 This ageless 48" Victorian contour bench has century-old beauty. The electrostatic powder coated cast aluminum frames & pre-finished White Oak slats; a combination that makes them exceptionally durable & rust-proof. Frame colors available are white, black, brown & green. The ornate styling of these benches creates an appealing look in any setting.